7 Stars!!! I watched Seder Masochism last night with full headphone sound and a hi-res screen and it was fantastic! Every bit as masterful as Sita Sings the Blues. 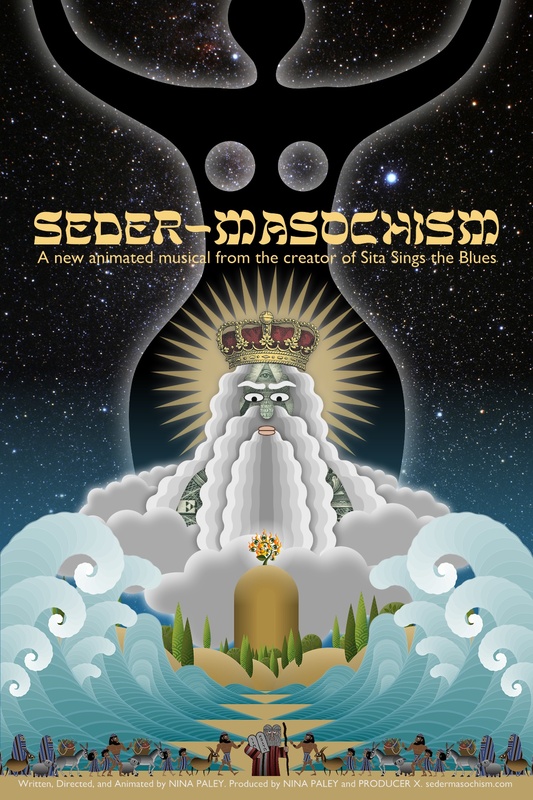 Seder Masochism is an iconoclastic and eclectic cross-section of visual design, cultures, music and History – that is both deeply moving and also humorous. An awe-inspiring work of genius!! Does not disappoint. Nina Paley has established herself as a Force-to-be-Reckoned-with in the film and art world and beyond. Nina, this is an amazing piece that really does show many interesting aspects of both Jewish and Egyptian culture and history. I do love that humor is mixed in here and there, which made it more enjoyable. There were a few parts that made me a little uncomfortable, but I know we don’t share the same faith-based backgrounds, and that’s okay. I do still love and respect your work. I also love how you can clearly see in this film how much your father loves you and wants you to have a good life. You are very blessed to have that. Keep up the great work, I look forward to seeing your next film. On a side note “Sita Sings the Blues” is still my favorite work of yours, as well and one of my top favorite movies.